Fixing a broken pipe or thawing out a frozen pipe can be a difficult task. If not done properly, other problems could occur down the road. Dean’s professional and fully trained plumbers have years of experience replacing waterlines and repairing pipes from the street all the way up to the faucet. Our expertise will allow us to quickly repair broken pipes with minimal disruption to your home and life. With over 35 years of combined experience working in Minneapolis and the surrounding Twin Cities metro, we’ve seen many different types of plumbing and can fix any frozen or broken pipe, no matter how big or small the problem is. 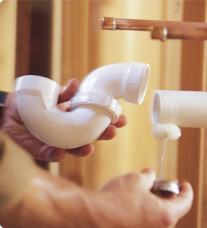 Call us today to have your pipes repaired by our experienced plumbing technicians.